Casa Campo de Ana: A rural paradise in the Sierra de Cádiz. 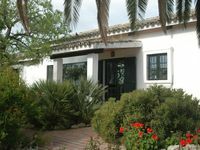 Property 2: Casa Campo de Ana: A rural paradise in the Sierra de Cádiz. Property 19: Property with two apartments for two people each. Property 22: Cabañas de Verón. Among the pine forests of the dehesa de Roche. Property 26: Garden, swimming pool, private parking, wifi, pool, air conditioning, central. Property 27: Casita Chau, Stylish 1 bedroom wooden house. Property 37: House for a relaxing holiday, pool and good weather. La Casa Nazari, cottage with wifi and fireplace. 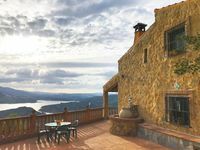 Property 42: La Casa Nazari, cottage with wifi and fireplace. Amazing home with everything you could imagine! We loved our stay at Casa Campo de Ana. The view is breathtaking and I could've spent the whole week on the terrace drinking the bottle of wine the hosts provided us. The house is perfect. The hosts have thought of everything, they even included a first aid kit for just in case. We were 6, 3 adults 3 children, with plenty of room. The town of El Gastor has a grocery store and delicious restaurants. Nearby towns are perfect for exploring and hiking to old ruins with gorgeous landscapes. Drive a little further to reach the major cities of the area. We loved our stay at this gorgeous house with amazing hosts! Thank you for letting us enjoy your home.